South of N.H. Route 119 in the Upper Village of Ashuelot on Bolton Road over the Ashuelot River in the Town of Winchester. Town lattice truss patented by Connecticut architect Ithiel Town in 1820 and 1835. The bridge is 169'0" long and made up of two spans of 77'0" and 77'3" in length. It has an overall width of 28'6" and has a maximum vertical clearance of 11'7". There are sidewalks on both sides of the bridge. The structure is currently posted for six tons. 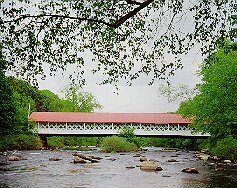 The Ashuelot covered bridge is considered by local historians to be one of New Hampshire's most elaborate covered bridges. The original purpose of the bridge was to transport wood across the river for use by the Ashuelot Railroad. The railroad had a station in the village of Ashuelot. This structure has also been called the Village Bridge or Village Station Bridge. Some sources credit Nicholas Powers as the builder. The Ashuelot Bridge is listed on the National Register of Historic Places.